Brooklyn Bob and I are currently in complex negotiations over a trans-Atlantic tasting event, and the issue of which beer to feature is causing us some headaches. 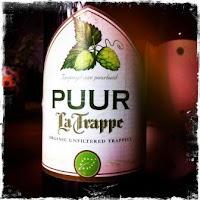 When I suggested La Trappe Puur, he scoffed, saying we’d tried it before, and it didn’t deserve a write-up, let alone an international podcast. But I can’t remember ever having tried it, and I have no notes on it in my master list, so I decided to test Bob’s theory and open a bottle of it tonight. I haven’t been a great fan of the La Trappe products, and I’ve tried most of the beers from this Dutch Trappist brewery: La Trappe Blond, La Trappe Dubbel, La Trappe Quadrupel, and La Trappe Witte. But none of them impressed me hugely. Organic La Trappe Puur, however, is quite good. Sorry, Bob. It’s got a thinnish mouthfeel, and it’s very sharp and wonderfully hoppy. Refreshing. The relatively low alcohol level (4.7%) makes it go down easy, and I can imagine it as a very solid session beer. Overall, La Trappe Puur is much like the fantastic Westmalle Extra, though it is missing that spiciness.